As reports of Fidel Castro's deteriorating health increase, so also does speculation about who will follow El Comandante. 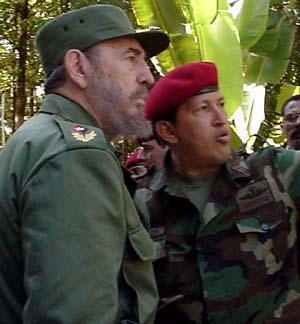 Fidel leaves only one real successor, and he is Hugo Chavez, the president of Venezuela. He is Castro's legacy to Latin America and the United States. Chavez inherits Castro's hatred of the United States and love of Marxism, but, unlike Castro, he has the money to put words into action. Because Chavez controls Venezuela, one of the world's largest oil producers, he is able to indulge in many of Castro's Communist goals and ambitions for a Socialist Latin America. From the United States to the tip of South America, Chavez has attempted to isolate and humiliate the United States, using its oil wealth, the sale of narcotics, satellite-directed propaganda, and the support of Communist guerrilla groups to accomplish his ends. To an alarming degree, Chavez is meeting with success. In past decades, Venezuela provided the U.S. with a large percent of its imported oil. Now, under Chavez, that same oil dependence is being turned against the U.S. with the threats of an oil embargo against the U.S., and public statements from Caracas that millions of barrels of Venezuelan oil will now go to Communist China. Chavez feels a special closeness to the Chinese elite. For over a decade Chavez has boasted that he is an ardent admirer of Mao Zedong, the still-revered founder of China's Communist regime, and murderer of some 70 million of his fellow countrymen. Like China, Venezuela is embarking upon a multi-million dollar arms build-up, and, again like China, many of the armaments will come from Russia. From advanced small arms to submarines, Venezuela is spending a substantial portion of its oil wealth on its armed forces - much to the dismay of its neighbors - particularly civil war-torn Colombia. Most recently, the Mexican government charged that Chavez is operating a narcotics smuggling operation from Venezuela into Mexico - and presumably to the United States. While he has not yet achieved media star status and U.S. press adulation of his mentor Fidel, Chavez has purchased a satellite system which promises to spread his Marxist dogma throughout the Western Hemisphere, if not the entire world. Telesur's 24/7 network broadcasts attack United States, free market economics, and assert the unlimited blessings of Chavez brand of Marxism, the "Bolivarian Revolution." The current reach of the Telesur network is some 20 nations, with plans for nearly worldwide coverage. Whenever Castro dies, Chavez stands as the Cuban dictator's surest ideological successor, and a military alliance between Havana and Caracas guarantees that Chavez will at least attempt to keep the Communist regime in Cuba alive after its founder meets his Maker.